We are allowed to use this cheesy joke because Peter Card, who kindly sent us this picture, made virtually the same admission when he sent us this picture. 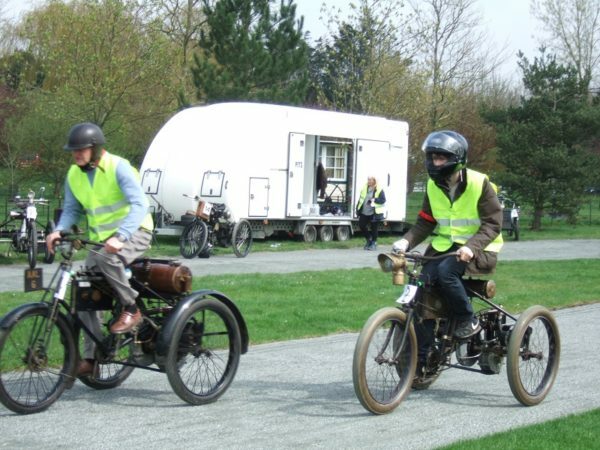 We can see here Peter, formerly chairman of the SAHB and now chairman of the Michael Sedgwick Memorial Trust, riding a 1900 De Dion-Bouton tricycle and overtaking to win his race at the annual tricycle racing event at Barnards Farm, Essex last Sunday, 15th April. Peter also makes two other admissions: that this was his only success of the day (well, we think that even one win is worthy of our congratulations), and that sadly he does not own this beautiful machine, and merely borrowed it. He tells us that he would love to own it, because Mr George Leversage Benbough, who had it between 1933 and 1960, lived in Alexandra Road, Reading, Peter’s home town. He remembers watching it running when he was about 10 years old. At the age of 18 Peter went to the AWF Smith sale, where this very machine was on offer, but he naively thought that £200 for a tricycle was outrageous! The tricycle is famous enough to be well documented on the De Dion-Bouton UK website – and we know from this and from Peter that the Nottingham registration AAL 6, applied to the machine in 1933, is almost certainly the only number that the vehicle has ever had, and is thus very much part of the history of the vehicle. AAL 6 took part in the London-to-Brighton Run in 1934 – and its 1934 tax disc remains fitted to the machine. We also know that it is a single-speed machine with a rebuilt 2¾ hp engine – 75mm bore, 76mm stroke – a period Brissard head with gill radiator, and original coil. The machine has been more active in the recent past than the preceding 75 years, successfully completing various events in the UK and on the Continent including the London to Brighton, the Pioneer and Banbury Runs and the DDBUK inaugural Jarrott run. We have only one final comment to make: we think that to win a race with only a single speed available is highly commendable. Perhaps next year Peter can borrow a two-speed tricycle and win two races!